There are some Saronite Nods in Zul'Drak now to. So if you got good gear you could farm for ores there, there aint many players there now in the begining of wotlk. I got over 200 ores (both cobalt and Saronite ore) on just one days farming there at lvl 70. As a level 70, I ran a ring around the outside and skirted around some of the pillars and found an abundance of Rich Saronite and Saronite nodes (along with Titanium nodes). If you are careful, it is suprisingly easy to mine these with a level 70. I went to here and it worked very well for me. Just for those wishing to know the skill level to mine this it is 400. Just so you don't think you can take your 70 to a node and farm straight away. I think Sholazar Basin is the best place to farm Saronite(as the map shows). Got 168 Saronite Ores and 30 Titanium ore in about 30 min just by circling around the riverbanks and the 5 Pillars. Eh. Sholazar's overrun on my server. People on top of people mining these things. Guess I'll try somewhere else - I'm not going to fly around for hours just to watch some idiot grab it before I can get to it. If the most upper poster meant that he was getting the veins from Zul'Drak. I think many people will be dissapointed. First of, the run shown on the link takes you between level 76-ish mobs, with nodes inbetween them. So no way to get there at level 70. Unless your pet can tank them up while you loot the mine. Also, doing that run only got me to 1 Saronite vein, which was trapped under a staircase. The other veins were all Cobalt. I doubt the accuracy of the veins in Sholazar Basin, 337. While Zul only has 8. Sholazar is overrun on my realm as well. The best place I've found so far, is Wintergrasp. As long as you don't go there while a battle is going on, you should be fine. I did a few laps around there earlier today and didn't come across any other miners. I found 3 or 4 Rich Saronite and at least 1 Titanium along with several regular Saronite nodes each lap I did. If anyone here have gatherer and if you are playing on skullcrusher. add me we can share info about node ^^. I don't know why nobody has mentioned this, but Saronite is pure evil. Sholazar Basin is no doubt the hottest farm spot in all servers, most probably you will find tons of people in that zone. Hence, I gave up the idea to farm in SB and go to Icecrown instead. It is definitely has lesser people and nothing bad compare to SB. Follow this route, you can easily have 10 stacks of Saronite, few stacks of Crystallized Shadow and Earth and some Titanium within 1-2 hours. If saronite is related to Yogg-Saron, and Yogg saron is supposedly under Grizzly Hills, Why is there no saronite there? The best zone to farm this kind of node is Sholazar Basin. Icecrown and The Storm Peaks zones are full of farmer players and that decreases downtime greatly. Sholazar, on the other hand is not a top level zone, hosting mostly the people who are questing, not farming. Especially, the eastern part of Sholazar seems to have a slightly higher respawn rate than the western part. After around thirty minutes of mining, i'm pretty sure the amount of deposits in Sholazar Basin have been around halved as of 3.0.8. Amazingly enough, the drop rate is NOT 100% for saronite ore from these deposits. I just mined one in Storm Peaks and the only ting i got was a Crystallized Earth! no ore! My guess is that is what someone did. Then you came along and all that was left was what you got. As seen by the maps now i was in ice-crown and although the path was a little more difficult to figure out every time i ran by a saronite vein there was at least another sometimes 2 around it as well. They Spawn in clumps it seems like, and by the time you make it around the respawns have already hit. 18 Stacks of saronite from ice crown in about 1hr 30min, however titanium yeild was low i didnt care, no Allies to deal with. Note: it was kind of difficult at some place being a warlock and most of the zone being undead fearing was not an option, i just skipped over the mob heavy areas. Competition is very heavy in Sholazar Basin, as stated before. My server has quite a low population, and I've seen multiple people on at 4AM on weeknights farming in SB. That said, people farm here for a reason. Spawn points are incredibly dense around the perimeter of the zone, and as such you can achieve a very regular farming circuit. Furthermore, mobs here are three to five levels lower than those in Icecrown, which makes it that much easier to deal with any mobs that may be guarding a node you're about to mine. Icecrown is in many ways the exact opposite of SB when it comes to mining Saronite. Spawn points are heavily clumped up in discrete sections; I've seen up to three nodes appear on my minimap at the same time. Player competition seems to be a bit lighter, at least on my server, than in Sholazar. However, mobs here are considerably tougher than in Sholazar, especially in the northwestern areas, where the mobs are elite. Moreover, the nodes tend to be more frequently guarded by mobs in the first place; this may be due to positioning, but part of it is simply because the higher level mobs in Icecrown have wider aggro ranges. My preference is to wait until off-peak hours and then farm in Sholazar. Icecrown may be more rewarding if you are a well-geared DPS class and killing the mobs around your nodes does not take long for you. At location 30.4, 58.9 I mined Saronite Ore(1), Crystallized Shadow(1) and Twilight Opal(1). Sholazar Basin is the best for a-lot of Saronite Ore, and along the same general route you can get lucky enough to spot some Titanium Veins as well. Titanium are rare veins so if u dont get any, dont be worried, it took me a while to get 22 Titanium Ore. This is also a good Ore to farm when u need gems, if u or someone u know can prospect the Saronite you get then you can most definatly get quite a few gems, i do this and got about 100 gems from the 500 ore i prospected plus the 400 i already have in the bank from being a JC..
5 hours of mining in Sholazar Basin. 35 diff gems, 10 being blue Quality. I hope this helps a bit, i was also lucky with the Titanium becuase i was alone mining for 5 hours, so i didnt have to compete with other players, i sugest going and mining from 2 am server - 5/6 am server. its the most quite time to mine. For some reason nobody on my server goes to the pillars. It's a bunch of people on the outter rim. Of course I fly around it too, but I also go into the basin itself. I've found something really weird about each pillar in doing so: Every pillar has three ores at a given time. I simply circle the pillar, mine all three, then go to the next pillar, and pick up any more ore I see on the way. Edit: Excluding Suntouched Pillar, the Venture company kind of makes it pointless to even try if there is an ore.
You ever get that, "you can't do that because you are mounted." warning while you are trying to mine a node? The sit key (default 'x') will make you fly straight down, opposite to jump which makes you fly straight up. So if you fly next to a node and hold x you will land next to it allowing you to mine. I know it's made my mining easier. I wish everyone's comments would be like that. Great route! I get big amounts of ore every time I go around the zone. I wish everyones comments would be this helpful. Great route! Big amount of ore each time. Saronite deposits also require level 65 to mine. So, back to the adamantium/khorium grind for us. I think there should of been a 1% chance of mining Saronite you would go insane just like the Miners in the quest Slaves to Saronite, and have whispers in your head. Just a suggestion. Been having a lot of luck with the Basin and Wintergrasp for these / rich ones. They seem to be mineable at 425 and are still green at 450 (have to hit 75 to go higher than 450 skill I learned) ;). Of interesting note - at level 70 (rested), these give either 2,500 or 2,645 exp per vein / node. Since I just dinged 71, the same veins suddenly give 4,200 exp per node! Not sure if it's to compensate for the higher levels requiring more and more exp but so far the jump from 70-71 is not much if any exp it seems. I would highly recommend Wintergrasp for mining Saronite. Just make sure there's no battle in progress, and do a circuit round the edges. This is where I go when I need Saronite. And if your mining is up to 450, you can also pick up some Titanium (which usually has a lot of crystallized shadow, earth etc. that you may need for some professions). EDIT: Thanks for the downvote on me trying to help out. A lot of people have been complaining about node respawn times being nerfed hard sometime in Cata. Searching for Fel Iron/Adamantite/Cobalt was a nightmare for leveling my blacksmithing alt. However, one place I would HIGHLY recommend going that seems to be completely unaffected for Saronite/Rich Saronite is Wintergrasp. 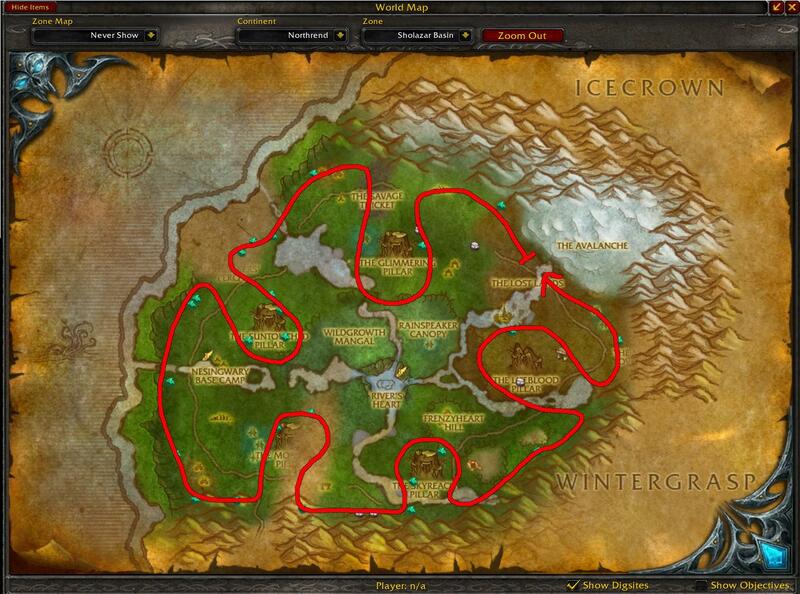 - Veins constantly respawn, much faster than any other zone I've seen. - Veins are tightly packed in, you won't be flying long until you see a node. - There are Titanium nodes here, so if your mining isn't 450+, you'll have to skip these, and it'll make saronite farming more difficult. If you're looking for saronite only, you still want to mine these, the crystallized elements you get off can either be used or sold, and usually a saronite node will replace it later on. Great blog post and i will fow you when you update. and hope fellow back, thanks. Collect the best Cheap Hermes Bags online. The top quality Replica Hermes Birkin more from the Hermes Birkin Outlet Luxury hermes birkin shop, they are on discounted, buy more get more, they are perfect Hermes Birkin 35. I took the advice of mining Saronite in SB and didn't have that much luck, which surprised me because everyone seemed to say that was the best place. Within an hour I had only about 2 1/2 stacks. Decided to try out Wintergrasp and had MUCH better luck. If you circle the edges of Wintergrasp there is a node every couple seconds. You can even go higher up on the mountains (where it becomes Icecrown) and there are a bunch up there too. Within an hour I have 8 stacks of Saronite and one stack of Titanium! Did the spawn rate in Sholazar drop recently? Even with CRZ, Icecrown still seems to be the best place to farm this ore.
Wintergrasp worked perfectly for me! Got about 1 saronite vein every 40 sec with master riding + few titanium, also suprisingly many of them were "rich". This object can be found in Icecrown (492), Sholazar Basin (420), The Storm Peaks (295), Wintergrasp (192), Zul'Drak (186), Halls of Stone, Dragonblight (18), Crystalsong Forest (16), Icecrown Citadel (6) and Grizzly Hills (3).